Canada won a Pan Am Games bronze medal in men's volleyball with a victory over Puerto Rico. 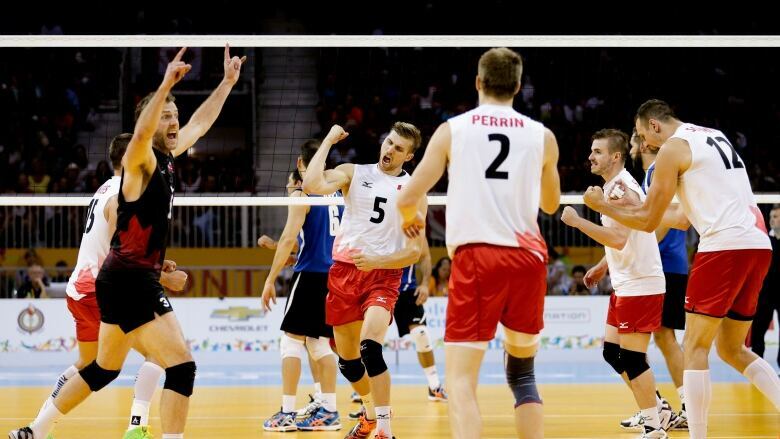 Canada won the men's volleyball bronze medal with a 3-1 victory over Puerto Rico on Sunday at the Pan Am Games. Canada took control of the game early, winning the first two sets 25-11 and 25-12. Puerto Rico won the scrappy third set 25-23 and gave Canada trouble early in the fourth. But the Canadians pulled away, with Puerto Rico making unforced errors and Canada dictating the game with big serves. Captain Gavin Schmitt of Saskatoon led the Canadians with 25 points, converting 19 of 27 spike attempts and scoring four points with his booming serve. Gord Perrin of Creston, B.C., added 14 points for Canada, with Calgary's Rudy Verhoeff scoring 13. Hector Soto and Ezequiel Cruz had 11 points apiece for Puerto Rico.